On Wednesday NFLUK Executive Vice President, Mark Waller spoke to Sky Sports News about the future of NFL in the UK. It was broadly the same conversation NFLUK have with any journalist in the last few years, but this time Waller spoke with more passion and certainty about a UK Franchise than we are used to. The growth of the NFL in the UK has been phenomenal, but there is so much more to this subject than this. 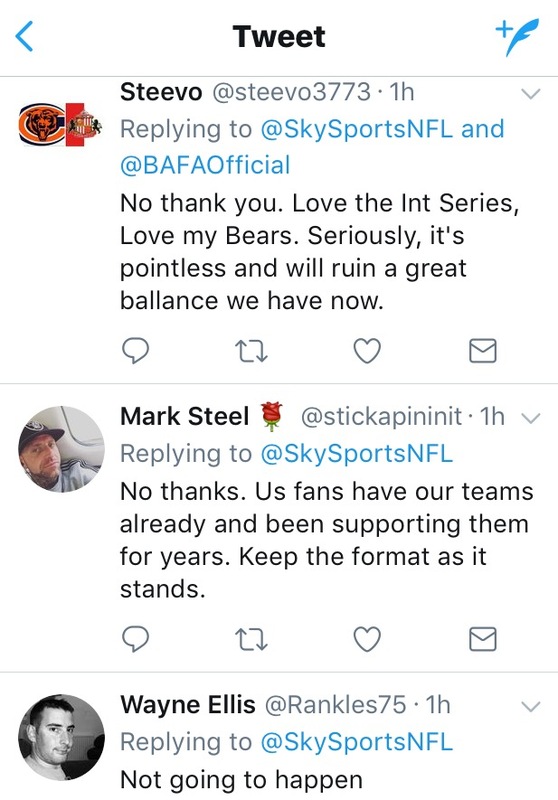 The games sell out because it is a rare spectacle, can NFLUK be certain that by giving 8 games a year we will all travel for all of them every week? I know I wouldn’t, I would wait until my team played here. And what of that team? – could the Seattle Seahawks play at home week 1, in Florida week 2, home week 3, away in London week 4 and back home again in week 5, that one hell of a journey! As you can see from the response on twitter, a London franchise isn’t the biggest of priorities for the UK viewer. 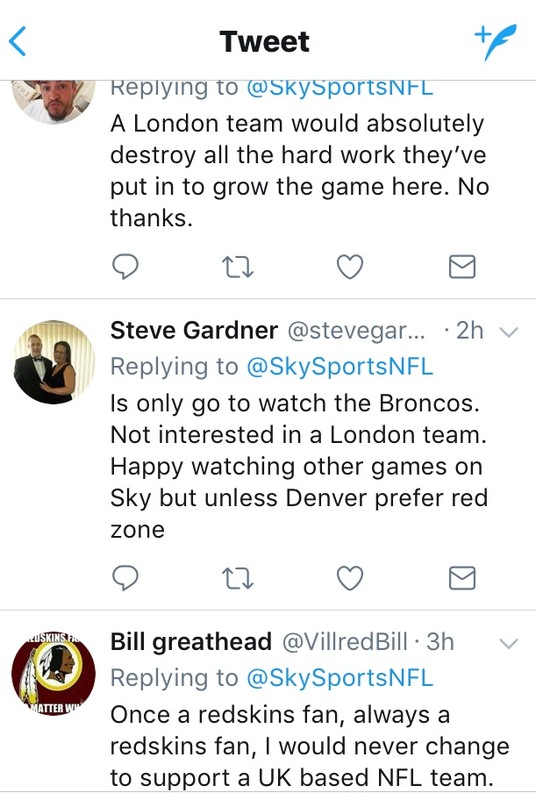 In fairness, it is a grand ambition, and who am I to lobby to deny regular NFL on our doorsteps.It may be the case that you are “once a Redskins fan always a Redskins fan”, the positive is that your team may turn up here every other year. In time our children will support the local team and it could thrive. Fair enough, but I would love to see these things go on tour, be it Prime Minister Questions, Later with Jools Holland, or the NFL, what’s the harm in taking the 4 games and putting say 2 in Wembley, 1 in Old Trafford and 1 in Murrayfield. I assume they are trying to prove that London is the city for a franchise, but at the same time testing the commitment of fans throughout the whole UK. I guess this makes very little difference to anyone, the tickets won’t start to become available until around April anyway so apart from booking holidays from work it’s as you were. What troubles me – and I get that there is no way of knowing when booking – is their talent at selecting games that are absolutely rubbish to send to us! I know people who have stayed away this year because of this and they have been proven right. But how they manage to always get it so wrong is beyond me! Having just had my first NFL at Twickenham experience I was surprised to see that it isn’t a popular venue. Yes the station is an abomination but you are a short walk from the District line and therefore much easier links to other stations. The atmosphere was great for the first 10 minutes up until any chance the Cardinals had left the game with Carson Palmer.